San Antonio – October 18, 2017 – Since NASA’s Dawn spacecraft detected localized organic-rich material on Ceres, Southwest Research Institute (SwRI) has been digging into the data to explore different scenarios for its origin. After considering the viability of comet or asteroid delivery, the preponderance of evidence suggests the organics are most likely native to Ceres. SwRI scientists are studying the geology associated with the organic-rich areas on Ceres. 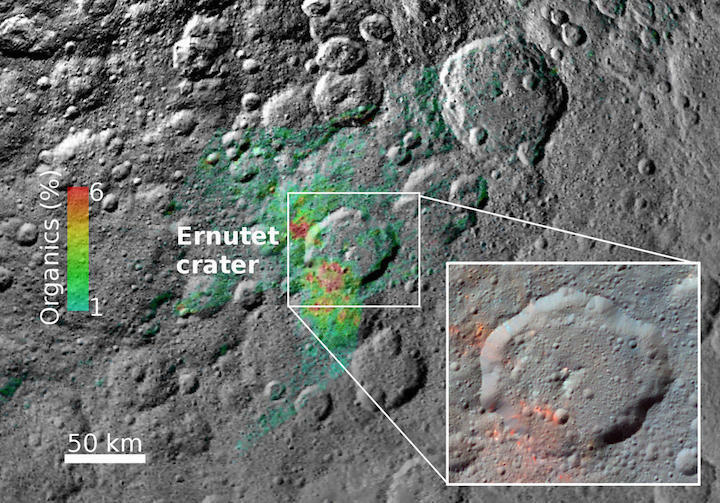 Dawn spacecraft data show a region around the Ernutet crater where organic concentrations have been discovered (background image). The color coding shows the surface concentration of organics, as inferred from the visible and near infrared spectrometer. The inset shows a higher resolution enhanced color image of the Ernutet crater acquired by Dawn’s framing camera. Regions in red indicate higher concentration of organics. WASHINGTON — NASA has granted a second, and likely final, extension for the Dawn mission, allowing it to continue observations of the dwarf planet Ceres through 2018. The extension, announced by the agency Oct. 19, means that the spacecraft will not leave orbit around Ceres, the largest object in the main asteroid belt, to visit another asteroid, an option project scientists said earlier this year was under consideration. The latest extension, the agency said, could allow the spacecraft to make high-resolution observations of Ceres. The mission team is studying options to place Dawn into an elliptical orbit that would bring it within 200 kilometers of the surface of Ceres. Previously, the spacecraft came no closer than 385 kilometers. Those close approaches, NASA said in a statement, would allow better measurements of the uppermost layer of the dwarf planet’s surface using the spacecraft’s gamma ray and neutron spectrometer, including determining how much ice it contains. Dawn will also collect high-resolution images and spectra on those close approaches. With the proposed shift to a lower orbit, Dawn will expend more hydrazine. The spacecraft should be able to operate until some time in the second half of 2018. That will allow observations of Ceres as it passes perihelion, the closest point in its orbit to the sun, in April 2018. This extension, though, rules out proposals to send Dawn out of orbit to another asteroid. Project officials proposed such an extended mission in the senior review of planetary science missions in 2016, which would have sent Dawn on a flyby of the asteroid Adeona in 2019. NASA rejected that proposal, concluding that Dawn would provide more science by remaining in orbit around Ceres. As that initial extended mission came to an end in June, project officials again suggested they were considering a proposal to send Dawn to another asteroid. “It’s an option,” Carol Raymond, deputy principal investigator for Dawn at the Jet Propulsion Laboratory, said at a June 13 meeting of NASA’s Small Bodies Assessment Group. She didn’t provide additional details about that option. Dawn, part of NASA’s Discovery program of low-cost planetary science missions, launched in September 2007. Using an ion propulsion system, it entered orbit around the main belt asteroid Vesta in July 2011, remaining in orbit there before leaving for Ceres, arriving there in March 2015. 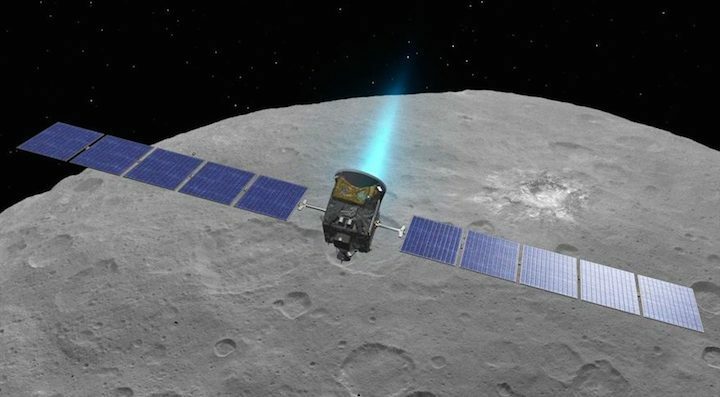 NASA said the extended mission will be designed so that, when Dawn depletes its hydrazine, it will be in a stable orbit around Ceres with no risk of crashing into the dwarf planet. WASHINGTON D.C. — Minerals containing water are widespread on Ceres, suggesting the dwarf planet may have had a global ocean in the past. What became of that ocean? Could Ceres still have liquid today? Two new studies from NASA’s Dawn mission shed light on these questions. Landing on Ceres to investigate its interior would be technically challenging and would risk contaminating the dwarf planet. 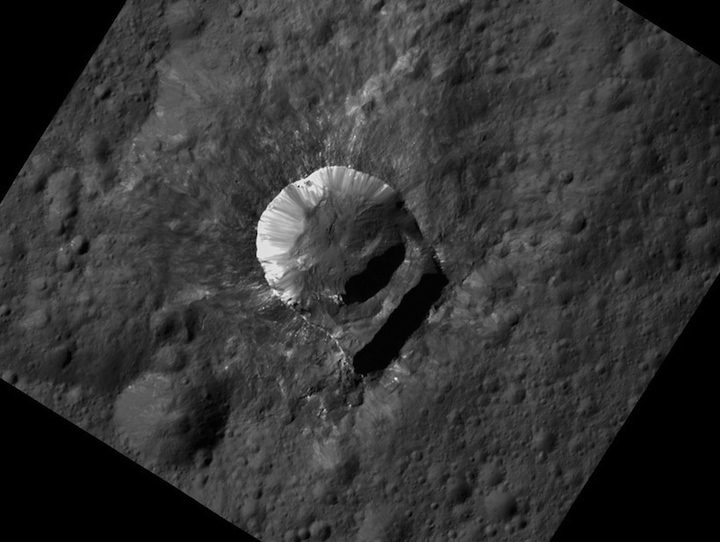 Instead, scientists use Dawn’s observations in orbit to measure Ceres’ gravity, to estimate its composition and interior structure. The first of the two studies, led by Anton Ermakov, a postdoctoral researcher at JPL, used shape and gravity data measurements from the Dawn mission to determine the internal structure and composition of Ceres. The measurements came from observing the spacecraft’s motions with NASA’s Deep Space Network to track small changes in the spacecraft’s orbit. This study is accepted for publication in the Journal of Geophysical Research: Planets, a journal of the American Geophysical Union. Ermakov and his colleagues’ research supports the possibility that Ceres is geologically active – if not now, then it may have been in the recent past. Three craters – Occator, Kerwan and Yalode – and Ceres’ solitary tall mountain, Ahuna Mons, are all associated with gravity anomalies. 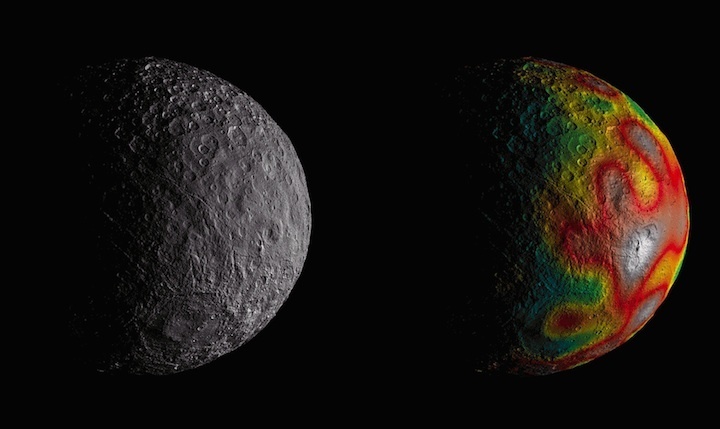 This means discrepancies between the scientists’ models of Ceres’ gravity and what Dawn observed in these four locations can be associated with subsurface structures. The second study, led by Roger Fu at Harvard University in Cambridge, Massachusetts, investigated the strength and composition of Ceres’ crust and deeper interior by studying the dwarf planet’s topography. This study is published in Earth and Planetary Science Letters. If you could fly aboard NASA's Dawn spacecraft, the surface of dwarf planet Ceres would generally look quite dark, but with notable exceptions. These exceptions are the hundreds of bright areas that stand out in images Dawn has returned. Now, scientists have a better sense of how these reflective areas formed and changed over time -- processes indicative of an active, evolving world. "The mysterious bright spots on Ceres, which have captivated both the Dawn science team and the public, reveal evidence of Ceres' past subsurface ocean, and indicate that, far from being a dead world, Ceres is surprisingly active. 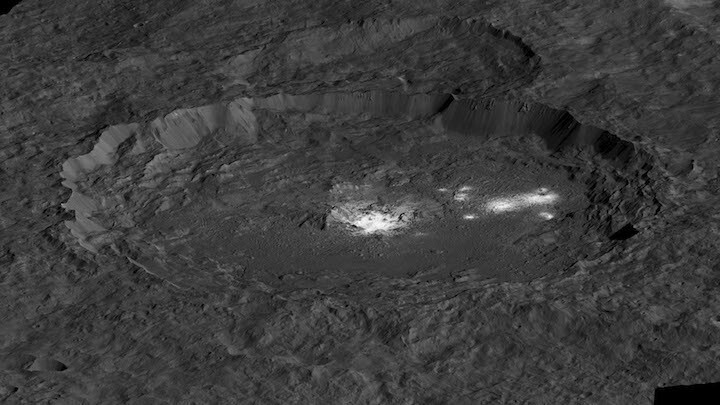 Geological processes created these bright areas and may still be changing the face of Ceres today," said Carol Raymond, deputy principal investigator of the Dawn mission, based at NASA's Jet Propulsion Laboratory in Pasadena, California. Raymond and colleagues presented the latest results about the bright areas at the American Geophysical Union meeting in New Orleans on Tuesday, Dec. 12. Since Dawn arrived in orbit at Ceres in March 2015, scientists have located more than 300 bright areas on Ceres. A new study in the journal Icarus, led by Nathan Stein, a doctoral researcher at Caltech in Pasadena, California, divides Ceres' features into four categories. 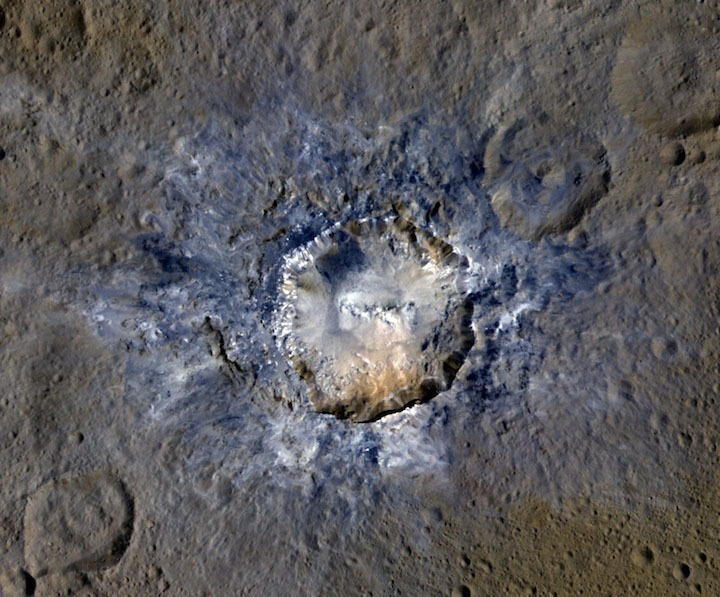 The mountain Ahuna Mons gets its own fourth category -- the one instance on Ceres where bright material is unaffiliated with any impact crater. This likely cryovolcano, a volcano formed bythe gradual accumulation of thick, slowly flowing icy materials, has prominent bright streaks on its flanks. Over hundreds of millions of years, bright material has mixed with the dark material that forms the bulk of Ceres' surface, as well as debris ejected during impacts. That means billions of years ago, when Ceres experienced more impacts, the dwarf planet's surface likely would have been peppered with thousands of bright areas. "Previous research has shown that the bright material is made of salts, and we think subsurface fluid activity transported it to the surface to form some of the bright spots," Stein said. The leading explanation for what happened at Occator is that it could have had, at least in the recent past, a reservoir of salty water beneath it. Vinalia Faculae, the diffuse bright regions to the northeast of the crater's central dome, could have formed from a fluid driven to the surface by a small amount of gas, similar to champagne surging out of its bottle when the cork is removed. In the case of the Vinalia Faculae, the dissolved gas could have been a volatile substance such as water vapor, carbon dioxide, methane or ammonia. Volatile-rich salty water could have been brought close to Ceres' surface through fractures that connected to the briny reservoir beneath Occator. The lower pressure at Ceres' surface would have caused the fluid to boil off as a vapor. Where fractures reached the surface, this vapor could escape energetically, carrying with it ice and salt particles and depositing them on the surface. Quick's analyses do not depend on the initial impact that formed Occator. However, the current thinking among Dawn scientists is that when a large body slammed into Ceres, excavating the 57-mile-wide (92-kilometer-wide) crater, the impact may have also created fractures through which liquid later emerged. "We also see fractures on other solar system bodies, such as Jupiter's icy moon Europa," Quick said. "The fractures on Europa are more widespread than the fractures we see at Occator. However, processes related to liquid reservoirs that might exist beneath Europa's cracks today could be used as a comparison for what may have happened at Occator in the past." The rounded shape of Kwanzaa Tholus is typical of tholi (plural of tholus) in general, but is different than other examples found on Ceres (like Dalien Tholus) and Mars. This region is particularly rich in this type of feature: The current Ceres map shows six named tholi and montes (slightly bigger mountains) in the region (centered around 32 degrees north, 327 degrees east) and several others including Ahuna Mons farther south. Scientists say Kwanzaa Tholus may have once been as prominent as Ahuna Mons, the tallest and most noticeable mountain on Ceres. Ahuna Mons is likely a cryovolcano, formed by the gradual accumulation of thick, slowly flowing icy materials. 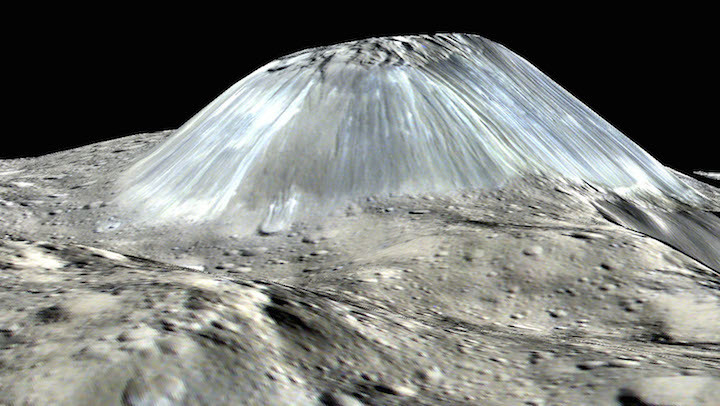 Because ice is not strong enough to preserve an elevated structure for extended periods, cryovolcanoes on Ceres are expected to gradually collapse over tens of millions of years. This means Kwanzaa Tholus and other tholi in that area could be degraded mountains, which also formed from cryovolcanic activity.